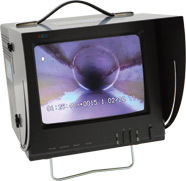 Ratech’s PH JR. small pipe inspection system is available with a FULL SPECTRUM SELF-LEVELING COLOR CAMERA or A STANDARD COLOR camera at a very affordable price; maintaining all the quality of our high end systems. Lighting for both cameras is accomplished by high intensity LED lights producing a detailed color/B&W picture for easy analysis of problems found. The PH JR. camera control unit (CCU) is a modified Hi-Res 9" color surveillance monitor with controls including a camera test terminal and video input/output for DVD recording and playback. It comes complete with an adjustable sun hood/protective cover.